Grow Your Business Selling a Product in Demand! Thanks to their unique qualities Valdani Threads are used by hundreds of designers and have grown more popular than ever. By carrying the Valdani line you cater to quilters, needleworkers, embroiderers, cross-stitchers, spinners and weavers alike, offering them an absolutely Guaranteed Colorfast Hand-Dyed thread product in awesome designer colors that they LOVE. These threads do fly out your shop doors when you use the BIGGEST POINT of SALE: let your customers know that the Valdani really are the only threads on the market which are Hand-Dyed and GUARANTEED COLORFAST. In ALL the colors. THE thread to TRUST! Always! Take also advantage of the Marketing Tools we offer. 197 Colors in Cotton. This colorchart will show you the most popular colors in our cotton products. Find the perfect thread for your project! 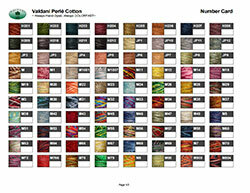 The colorchart also has information about the different products in cotton we sell. You can get it for yourself, your store or your customers. Why should I always use Valdani threads instead of the threads the pattern calls for? 100% GUARANTEED COLORFASTNESS in ALL Colors. Richer Colors (Hand-Dyed in a unique artisan procedure to achieve special color richness and intensity). More Yardage for the same price. To use a high-quality environmentally-friendly product. Use these conversion charts whenever you want to give your project the beautiful Valdani look and benefits. 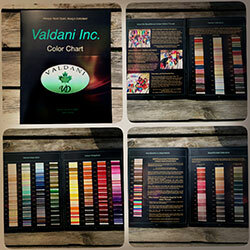 Keep in mind that the Valdani colors are not a perfect match for any other brand's colors, as they are unique! This "Number Card" will give you the possibility to keep track of your thread stock/stash colors. It lists the best-selling colors that you need. Print it out, one per thread type (wight, size). Then cross the numbers of the colors you already have and don't need more of and leave the color numbers for the colors you need. For crss-reference, do this process while having the valdani web site (www.valdani.com) open on the thread type you are working on. Please, feel free to browse through our newest Catalog. Print it out and use it at your convenience.